Is an NVQ for you? 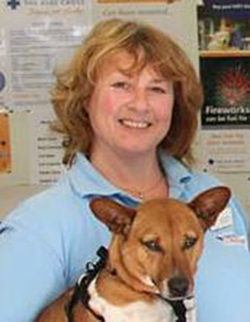 Paula Pearce, receptionist at The Blue Cross in Northiam, was pleasantly surprised! I have always done different jobs that have fitted in around my children, so when they were older, and I landed the job of receptionist at the Blue Cross I was very happy. I had a lot to learn, but as I have always been good with people and enjoy talking to them, my new role was perfect! When my manager asked me if I would like to do an NVQ in Customer Service, I said no, there was no way that I was going to make a fool of myself when I couldn’t do it I thought to myself, as visions of school came rushing into my head. Eventually after a couple of years with my colleague’s encouragement and a little trepidation I finally said yes. I can honestly say that I am really glad that I did the course and am very proud of my certificate. The assessors are brilliant, always helpful and encouraging and there for you from start to finish. I would definitely say go for it and add that qualification to your CV!